Can the Raptors Make the NBA Finals? With LeBron James out West, can Kawhi Leonard and the Raptors make the NBA Finals? The Open Floor podcast debates. After 8 years of bullying Eastern Conference foes, LeBron James is a Los Angeles Laker. Unlike the stacked West, the East is top heavy with teams such as the Celtics, 76ers and the Raptors. Toronto in particular could not have been more excited to learn about LeBron’s departure. He dismantled them year after year and the Cavs swept them after they won a franchise record of 59 games. Dwane Casey, who won coach of the year, was relieved of his duties and All-Star DeMar DeRozan was traded to the Spurs for Kawhi Leonard. With LeBron gone and with the addition of Leonard, this might be Toronto’s best shot at the East crown. The Open Floor podcast discusses the state of Toronto after the Kawhi trade and debate whether they can make the Finals. Andrew Sharp: I don’t believe in the Raptors whatsoever this year. I was having a conversation with someone who works for another Eastern Conference team, who told me, ‘I got the Raptors finishing first in the East. Basically what they did was take an All-Star off their team and replace him with an MVP candidate—and they are going to be awesome. 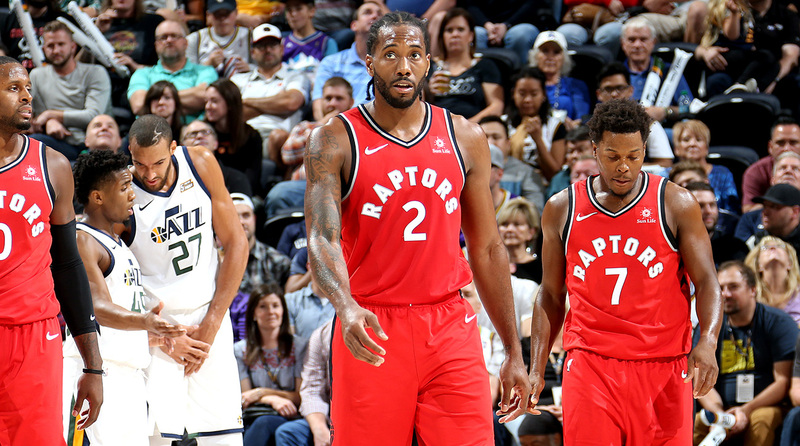 The Raptors are long, versatile, super deep and everyone is sleeping on them.’ At the time, I was laughing in his face but as I think about it, that is all very true. This Raptors team was awesome last year and if Kawhi is Kawhi then they are better than they were a year ago when they won 59 games. They could be really, really good. Ben Golliver: For sure. People were trying to say the same thing about the Spurs. Like how they didn’t have Kawhi last year and won this many games and they add an All-Star but that’s not true because of all the guys they lost. But the flipside for the Raptors is actually true right? They are getting a massive upgrade at the wing position. We don’t have to bury DeMar as we did in previous years but Kawhi is better in every aspect of basketball than DeMar is and they didn’t lost any meaningful players from the rest of their rotation. They had the best bench in the entire league—those guys are going to be accustomed to playing with each other and are going to have more chemistry and camaraderie right? So the whole season comes down to how well do Lowry and Kawhi fit together and then how close to his ceiling does Kawhi get and how healthy can he stay? Those are the main fundamental questions. But I still think even in a best-case scenario, I’m not sure I trust them more than Boston. I still think Boston has more top-end talent coming from more places. I think Toronto vs. Philly is more of a coin-flip. I will take Philly at this point but I can absolutely see arguments from Toronto’s side. If I was a Raptors’ fan, I would be playing the disrespect card because that’s what they do. They have been doing it for five years and I will be saying, we should be right there viewed with Boston as the class of the conference and everybody else is chasing us. Sharp: And they are not entirely wrong in that department. I agree with you in a playoff series, I just don’t think they have enough firepower to deal with the Celtics monster that is coming but to me they should be clear No. 2. Golliver: I really wish they had a time machine for Danny Green though. I wish they had 2014 Danny Green, who of course is one of the players nearest and dearest to my heart—because that version of Danny Green would make this team sick. They would be so unreal fun to watch and have outstanding three-point shooting ability from every position—but I don’t think Danny has that anymore. Sharp: He’s not that guy anymore and a lot of people on Twitter keep harping on the fact that the Spurs lost Danny Green in addition to Kawhi. Danny Green wasn’t giving them that much over the last couple of seasons, so it’s not a crushing blow to San Antonio. It would be cool though if he can help out and contribute for 20 minutes.